When asked about this place it's always a struggle to think of words to do it justice. For it is quite simply breathtaking and will likely be like nothing you've ever experienced before. All the canyons described here are peaceful places, escapes from the modern world. But this particular route is extra special and well worth a day of anyone's time. Approach: In order to keep to surfaced roads, we recommend starting in the mountain village of Fleix. The CV-718 from Orba leads to the village. Park in the large car park on the edge of the village near the primary school. An information board shows the paths down to the barranco. Continue walking along the CV-718 for a couple of hundred metres towards Benimaurell and turn right onto the PR-147 and shortly after passing Font Grossa take a track heading down and right. This passes through a 'Forat' (big hole) in the cliffs and in doing so enters into breathtaking scenery. Follow the excellent path as it zig-zags (Revoltes) downhill under the big cliffs. From the river bed go straight ahead and back up the opposite hillside on similarly easy stepped tracks to reach the hamlet of Juves d'Enmig. Here you will see the top for the barranco. Follow tracks through the Almond grove and soon descend again into ever more breathtaking surroundings to reach the river bed. Turn left (downstream) to reach the head of the barranco. Note: if there is evidence of flowing water here do not continue into the barranco unless you are prepared for swimming! Descent: 10 abseils make up the bulk of the descent. Lengths vary from about 3 metres to 12m. 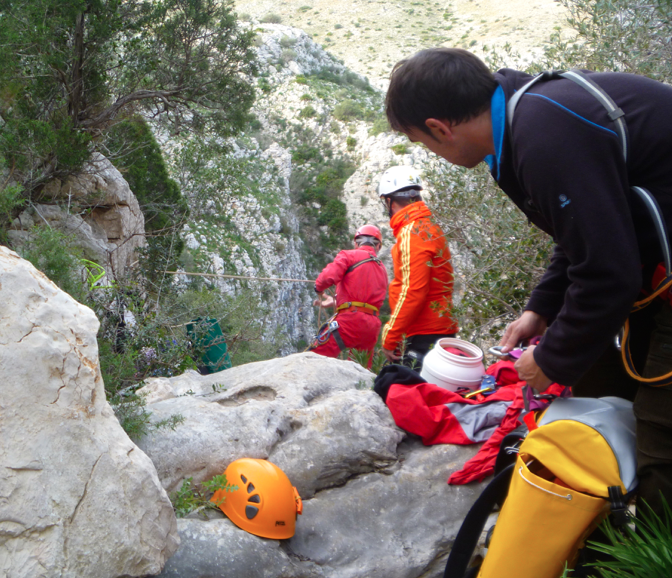 There are 2 via ferrata equipped traverses (2016). The first provides the crux for most people and is strenuous, but an extra sling used as a foot loop eases things a lot. The second traverse is easier, but still requires the use of a sling to protect a slip. Way out: Once back on the dry river bed, follow this gently downstream, bearing slightly left at the only junction and continue for around 30 minutes to reach a large cairn. Turn right here and back onto the path used on the way in. This heads back through the Forat to Fleix. There's a small bar in Fleix, just beyond the parking. Equipment: The abseil stations are all bolted (Jan 2016). Harness; helmet; 30m rope; abseil device; prussik, 2 slings & 'biners for the via ferrata section. Dangers: Helmet advised due to rock fall potential. During flood conditions this would be a very serious undertaking, check the weather history and forecast. ​If you'd like a guide for these and many other canyons, ridges, climbs, and walks in the area, please get in touch anytime, we'd be very happy to help. This combination makes a really great day out in two contrasting canyons. 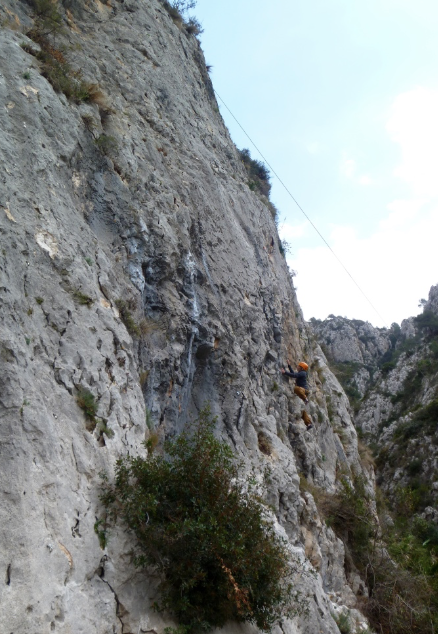 Barranco del Llidoners is all about huge free hanging abseils into mega amphitheatres and jaw dropping scenery. 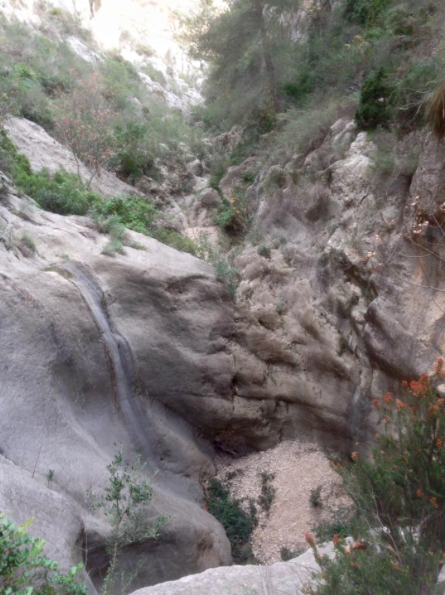 Barranco del Racons is more gentle, with beautiful rock sculptures throughout. Together they should easily fill a day. Approach: Starting and finishing in the sleepy mountain village of Benimaurell, park near the top of the village, in a large car park opposite a bar (good tapas). Follow the road uphill for a short way until a surfaced track leads down and right, take this as it sweeps first right then left and here leave the track and follow a shallow, vegetated channel to the right for about 50m to reach the first abseil station. Instead, follow the path right for only about 20m then descend back into the canyon, which by now is a shallow ravine. More bush whacking initially then more open and pleasant scenery lead to 2 further abseils. 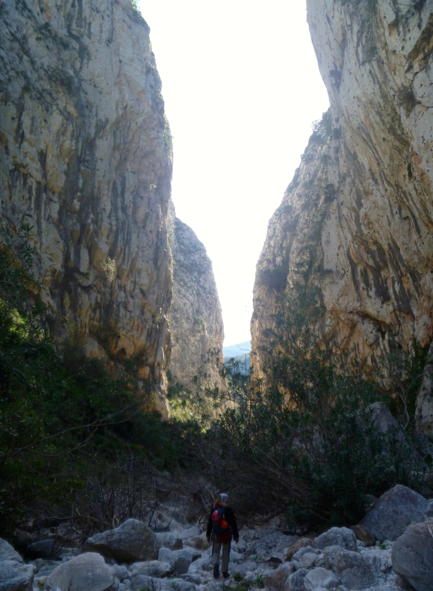 The Barranco del Llidoners terminates at it's confluence with the Barranco del Racons. Turn right into this and follow this beautiful dry stream bed with wonderful sculpted rock features as it flows towards the next and final abseil of the day. 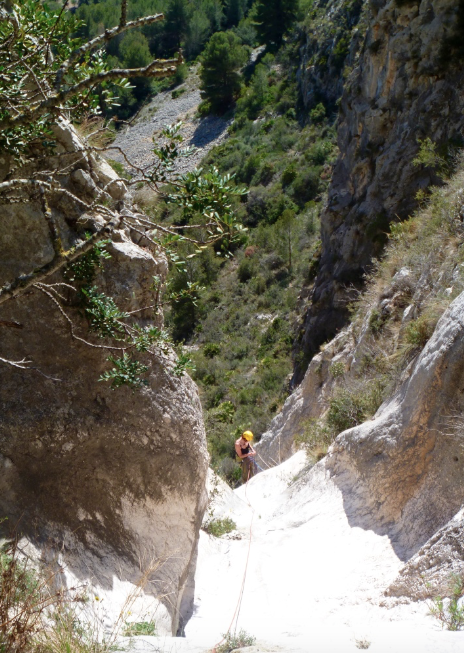 It is also possible to descend only the Barranco del Racons. To access this follow the PR-147 to below the Barranco del Llidoners. Time (car to car): As a guideline, allow at least 5 hours for a combined descent of these canyons. Additional equipment: we also had a 40m rope for the first abseil, this allowed us to move more quickly on the initial 2 abseils and keep waiting time to a minimum on the hanging belay. It's not essential to have the extra rope, but it's recommended for a group of more than 2 people. 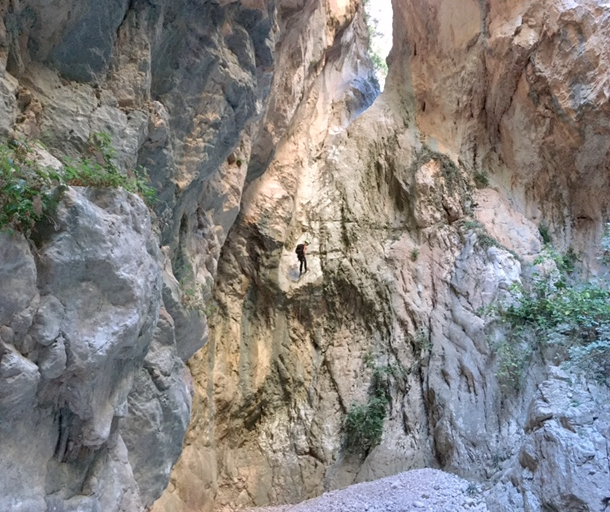 An easily accessible canyon in the savagely cut gorge below Castell de Garx. Using one vehicle as we have described here is straightforward, but for anyone wanting less walking then take two vehicles. A wilderness experience is guaranteed on this trip and the likelihood of seeing or hearing anything other than the local wildlife is minimal. Take the CV-715 from Tarbena to Bolulla, between 45km & 46km lookout for a sharp turning off to the right on a hairpin bend, turn off the main road here and follow this narrow, surfaced lane for about 2km to a green bridge, park immediately before this. Continue on foot along the lane to the Col de Garx (30 mins). From the Col descend on the main track for a few minutes until a sharp turning on the right, take this to walk through the Olive groves, passing a very sharp left and soon after the track bears right again to cross a gentle valley, take the lower path marked by a red dot. This track soon becomes rough and a further red dot marks the start of the descent in a narrow channel. Follow the narrow channel to the first abseil. The first 2 abseils are very short and can be down-climbed. A slightly longer abseil is soon reached, about 6m. The next abseil is about 15m and ends in a confined chamber, from here a fixed rope may be in place to help with a scramble out and on to the next abseil. This next abseil is 30m and soon overhanging. A scramble down then brings you into the main canyon and easy ground for a while. A short abseil leads to the 'tube' descent, about 15m of sliding fun (abseil) to a double bolt belay on the left (looking up). Arrange another abseil from here into the cavern below, this is steeper and about 25m (note: these 2 abseils can be comfortably be done as one). The scenery here is quite incredible, stay awhile to savour it. A couple more short abseils await, no more than about 10m each and you will soon emerge into the final chamber where a fixed rope may be in place (replaced Oct 2017) to aid a scramble out. The way out: Once the final difficulties of the canyon are passed, a walk along the dry river bed of about 15 minutes brings you back to the road by the green bridge. ​Equipment: The abseil stations are all bolted (Oct 2017). The short abseils have only single bolts, the long abseils are double bolted. Harness; helmet; 2 x40m ropes; abseil device; prussik. Dangers: Helmet advised due to rock fall potential. Avoid after any significant rainfall or during strong winds as this will increase the likelihood of rockfall. An easily accessible canyon in a magnificent setting. We think it's the best of the shorter canyons. The area has a distinct feeling of wilderness, keep a lookout for wild animals! Combine with a walk along the Malafi riverbed or simply a lazy afternoon in Castell de Castells. From the Jalon area follow the CV-720 towards Castell de Castells, around 5.5km beyond Benigembla turn right at the signpost for Pla de Petracos and follow this surfaced lane passing the caves to park after about 5km and in a lay-by on the right. There is a signpost here for the PR-CV168. Cross the dry riverbed and walk through the Almond & Olive grove, taking care not to disturb the crop. In front of you are 2 large crags with a large gash separating them, aim for the middle of the left hand (smaller) crag, once clear of the Almond grove the route is marked with Yellow and Green paint as well as cairns. Follow these upwards to generally trend right towards the gorge. Traverse high above the gorge with care, passing a couple of easy rock steps before a short descent to the initial abseil. The 1st set of bolts are set back and quite high up, don't miss them! We recommend abseiling about 23m from here to miss out the 2nd abseil station (this is inconveniently situated and not necessary). A series of fun and mostly short abseils follows, about 7 in total, although some are close enough to be combined. A few easy scrambles can be found along the way too. Don't forget to look up, the scenery towering overhead is pretty impressive. 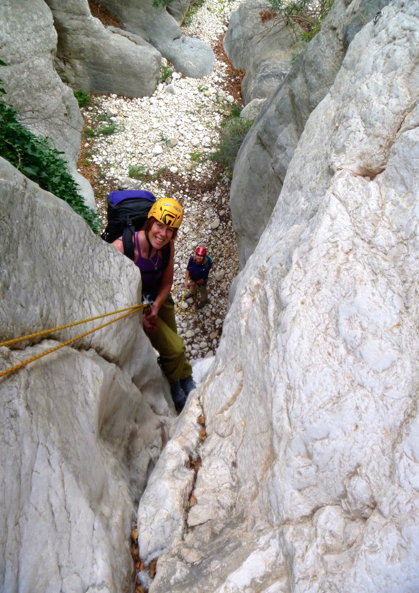 There are almost certainly a few quality scrambling routes to be found amongst the rocks surrounding this gorge. ​Equipment: The abseil stations are all bolted (Nov 2017). Some of the short abseils have only single bolts, the longer abseils are double bolted. Harness; helmet; 1 x50m rope; abseil device; prussik. This can be enjoyed in its own right, or combined with the Barranco del Infierno (above) to make for a really big day out. 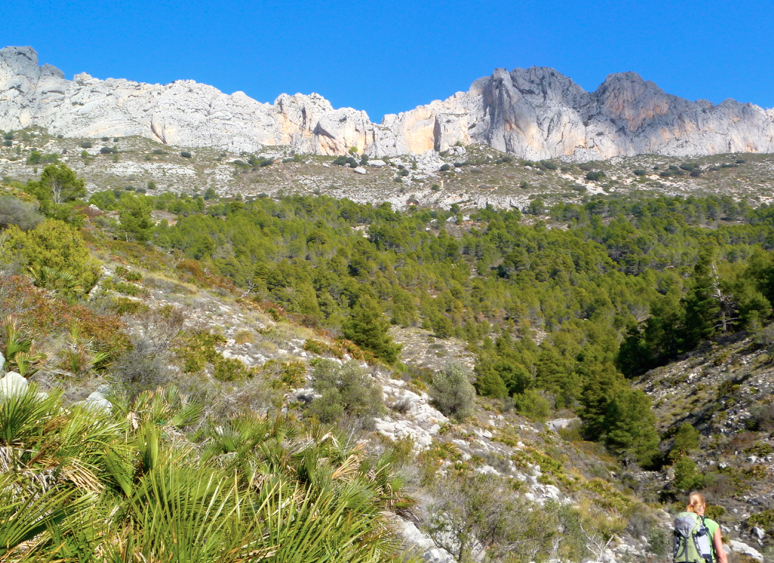 The walking / easy scrambling section along the Rio Girona is especially memorable with outstanding scenery. From the CV-715 Pego to Sagra road take the CV-712 towards Val d'Ebo. This mountain road winds its way slowly uphill, passing a hill with a cross on it and soon after reach a pass with a distinctive white building on the right (it has a turret feature). Turn left here onto a narrow, but still surfaced lane. Follow this for around 3km until just beyond to small houses on the right and the sign for the barranco is reached, this will be on the left and by a small parking place. From the parking area follow a track over the edge of the Almond grove heading to the right of a small hill and in the general direction of the small houses. Go around the back of this hill (overgrown) to reach the start. The initial abseils are short and well bolted. Some of this section is still a little overgrown. The final 2 abseils are down 1 very long drop of 64m into a cirque. A single bolt is used to reach better bolts on the edge and for the abseil. There is another lower abseil station about 40m down (on the right whilst looking in) and this makes for a more pleasant place to re-belay rather than on the hanging belay higher up. The way out: Pass through an overgrown section of path to reach the Rio Girona and turn left here. Follow this as it gently descends through spectacular scenery (some of the best we've ever seen). Soon after passing a disused dam, look out for a track on the left, follow this (the PR-147) to Juves d'Enmig turning left when the houses are reached and follow the lane (PR-43) back to the car. ​Equipment: The abseil stations are all bolted (Jan 2016). Harness; helmet; 2 x50m ropes; abseil device; prussik. Dangers: Helmet advised due to rock fall potential. On the sunny side of the Bernia ridge, the easy access and beautiful scenery make this a worthwhile day out. Approach: Take the CV-755 through Altea la Vella and continue until the turning for Sierra de Bernia recreation area (signposted), turn right here onto a narrow lane and follow this for about 2km to a small lay-by shortly after a track on the right (the return route). From here, continue on foot up the tarmac road for about 2km (or 30 mins) and look out for a dirt track on the right, take this as it gently descends and soon reaches a ruin below a small outcrop of rock. A cairn marks the route downhill on a minor path, this soon deteriorates (wear long trousers) but do persevere and you will soon reach a shallow barranco, follow a vague track along this to reach the first short abseil from a Pine tree. Descent: There are around 12 abseils in total, although some of these are short and over easy ground, so you may consider down-climbing some. The longest abseil is 30m, and all are from either bolts (some twin bolts, some single) or chains fixed around large Pine trees. There is a lot of scrambling during the descent, some is pretty tricky too, and plenty of vegetation to work through. Well worth wearing long trousers and long sleeves and making a noise to alert whatever animals are living there that you're there too! Even after a prolonged dry spell there will likely be water in some of the pools, but this should be avoidable with care. Just remember to look where you're throwing abseil ropes so they don't end up soaked! The way out: After passing a huge boulder, bear to the right, keeping right of more large boulders. Scramble up onto a feint path marked by a cairn and follow this to a good, wide track. Follow this easily back to the road. Equipment: The abseil stations are all bolted (Jan 2016). Harness; helmet; 60m rope; abseil device; prussik. We used 2 x 40m ropes which was more than adequate. How to get there: From the N-332 between Calpe & Benissa follow the turning for Xalo and Alcalali, then immediately after turn left onto the Pinos road. Shortly after passing through Pinos village, look out for the 19km marker post and Virgin Mary cross, turn left here and follow the lower branch of this small lane, continue along here all the way to the valley bottom and park here in one of the small lay-bys. More abseils follow, mostly shorter, and there's plenty of down-climbing too. Soon reach a very deep marmite, abseil into this (around 17m). There may be a fixed rope in place to aid the climb back out, but if not, be prepared to use 'combined tactics'!! Thankfully the difficulties here are short lived and soon things ease back to scrambling in an amazing place. Keep on the path as it zig-zags up to the broad ridge, then descend (following the occasional red dot) to reach a wide track / minor road, turn left here and go downhill. After a few minutes look out for more red paint and follow this to the left (near a house to your right), this track will take you to the approach road, follow this downhill to the car. This one is best done in ascent for maximum fun. The climbs are never more than about 6m and bolted belays exist for these if required. Approach: Take the CV-715 from Polop to reach the CV-70, go straight over at the roundabout and onto a surfaced track, this soon becomes unsurfaced but still easily driveable (and used by climbers accessing the Echo valley crags). The track turns right and becomes surfaced once more. Follow this as it zig zags uphill, just beyond a huge triangular crag there's a parking area on the left. Enjoy the view here before starting the walk in to the canyon. Walk back down the lane, under the crags and turn left onto a small path marked with a blue / green dot. This leads into the canyon. Ascent: A little overgrown in places and this adds to the adventure, there is also much great scrambling to be had in here as well as stunning scenery. The way through is always obvious and single bolt belays protect the more difficult sections of climbing. These are never more than a few metres at a time. As the terrain begins to level out, lookout for a broad ridge to the right, gain this and follow it with increasing interest to reach a fine summit offering spectacular views. An easy stroll from here reaches the parking area. Yet another sunny canyon nestling below the impressive Bernia ridge. Approach: Take the CV-755 through Altea la Vella and soon after leaving this small town turn right at the sign for Urb. Alhambra Spring. Follow the road through the urbanisation, turning left at a mini-roundabout and right shortly after to park at the end of the tarmac and at the beginning of the PR-7. Follow the PR-7 keeping to the right of a large water tank and follow the excellent track as it zig-zags (Revoltes) uphill, passing over a barranco on the way, keep on this track for approximately 30 minutes. When the final left bend is reached there is a small (vague) path leading through the scrub on the right, take this gently downhill and into the barranco, the first abseil of around 16m soon arrives. Descent: 8 abseils and lots of scrambling through beautiful scenery take you through this canyon. Maximum abseil length is 38m. Due to the easy angle of the longest abseil, with care the whole descent could be done using a 70m rope, but ideally take 2x40m ropes. Equipment: The abseil stations are mostly bolted (2016), but some use fixed rope on Pine trees. Harness; helmet 2 x 40m ropes; abseil device; prussik, spare cord / rope in case there's a need to renew the fixed cord. ​Dangers: Helmet advised due to rock fall potential. Also, check the weather history as flooded pools would prove difficult to exit! 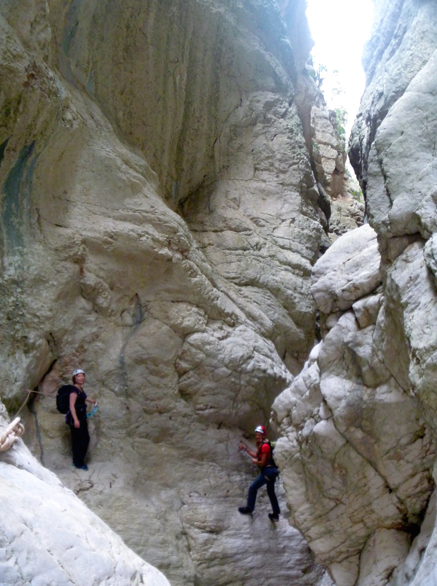 This is a short canyon with easy access via a short, beautiful walk through Almond grooves near the village. Approach: Park in Tarbena (plentiful free parking) and follow the village streets downhill, passing the church and on towards the cemetery on the outskirts of the village. Keep to the good track on the right of this and soon double back to contour through the Almond grooves (private land so please be discreet and take extra care not to damage crops). Take the line of least resistance to the lowest point of the Almond groove and follow this downhill, soon keep slightly right of the very lowest terrace and follow a small path through dense vegetation and steeply down to a prominent slab. Descent: Shortly after the prominent slab there is a down climb of about 6m, this is followed by another much shorter down climb and this leads to the 1st abseil (bolts on the left). 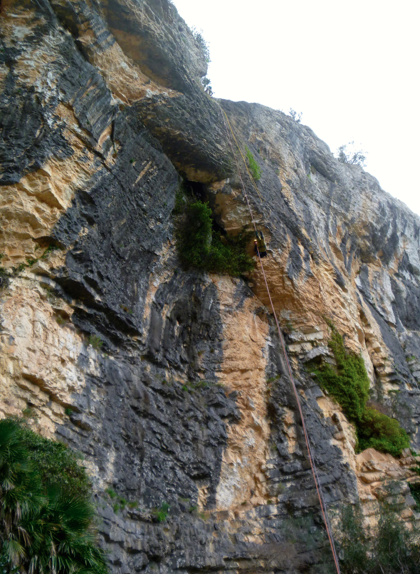 This 1st abseil is very easy angled and less than 20m leads to another bolted abseil. This stance is tiny and only suitable for 2 - 3 people max. The next abseil (2nd) is approximately 50m with about 10m of free-hanging descent through an ampitheatre. This is the bottom of the canyon. Bushes and trees provide some shade for a lunch / snack break. Locate a metal water pipe running up the hillside (on the left looking down the canyon) and follow this back to the cemetery. With super easy access, stunning scenery, and straightforward descents, this is a perfect starter canyon. Approach: From Tarbena follow the CV-752 towards Castell de Castells, after about 3km there's a cattle farm on the right, turn left just after this and follow the asphalt surfaced single track lane until it becomes concrete, park here. Walk across the lane to reach a small path, follow this, passing an abandoned building project and look out for a small cairn on the left, descend into the canyon from here. Descent: Initially the terrain is very straightforward, but the scenery more than makes up for this. A few short abseils of less than 5m then lead to a 20m abseil. 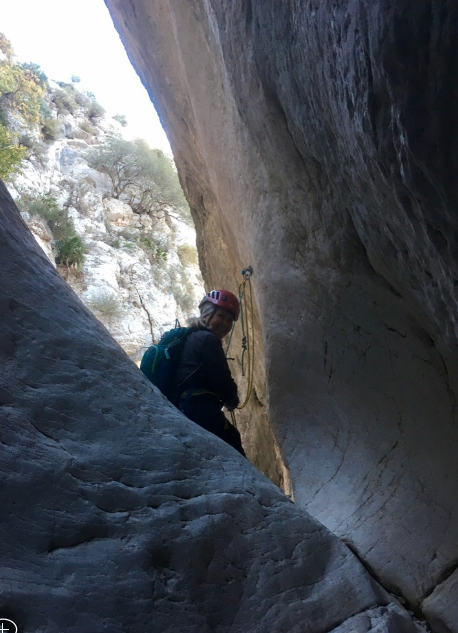 More short abseils continue the descent through the narrowing canyon before the terrain opens out at the exit amongst Almond / Olive grooves. Note: At the exit there is a newly bolted (2016) sport climbing crag to the right. A good range of routes exist here, but we don't have specific information on routes & grades at this time. 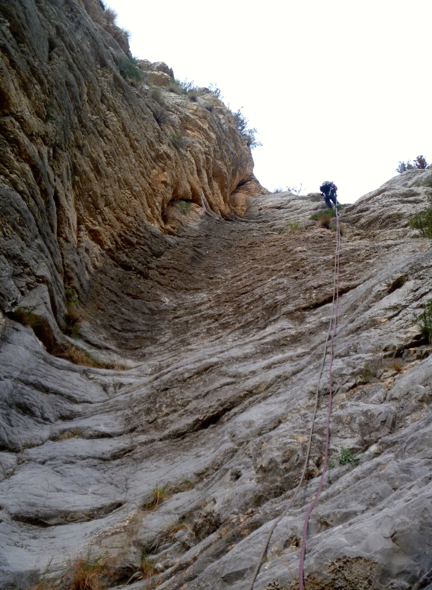 A good combination would be to descend the canyon then spend a few hours sport climbing.